Penelitian - The University of Texas at Arlington team show an approach named digital light 4D printing (DL4P) that creates dynamic 3D structures with programmed morphologies and motions. This approach encodes temperature-responsive 2D hydrogels with spatially and temporally controlled growth functions or target metrics, which transforms the hydrogels into prescribed 3D structures and programs their motions. Living organisms use spatially controlled expansion and contraction of soft tissues to achieve complex three-dimensional (3D) morphologies and movements and thereby functions. However, replicating such features in man-made materials remains a challenge. Previous studies of differential growth-induced 3D shaping have mostly formed single 3D shapes either at the swelled or the shrunk state. In contrast, Kyungsuk Yum and colleagues build temperature-responsive hydrogels with phototunable degrees and rates of swelling and shrinking allow us to define target 3D shapes at both the swelled and shrunk states. In particular, the ability to control the rates uniquely enables a new strategy for programming growth-induced 3D motions. This method simultaneously prints multiple 3D structures with custom design from a single precursor solution in a one-step process within 60s and is thus highly scalable. “Taking advantage of our phototunable hydrogels and the flexible 2D printing method for 3D material programming, we established simple yet versatile design rules and the concept of modularity for creating complex 3D structures with diverse morphologies, including ray-inspired structures with programmed motions,” said Yum. Experimental and theoretical studies reveal that the spatially nonuniform rates of swelling and shrinking of growth-induced 3D structures determine their dynamic shape changes. Furthermore, the swelling and shrinking rates of our hydrogels are phototunable and thus locally programmable. 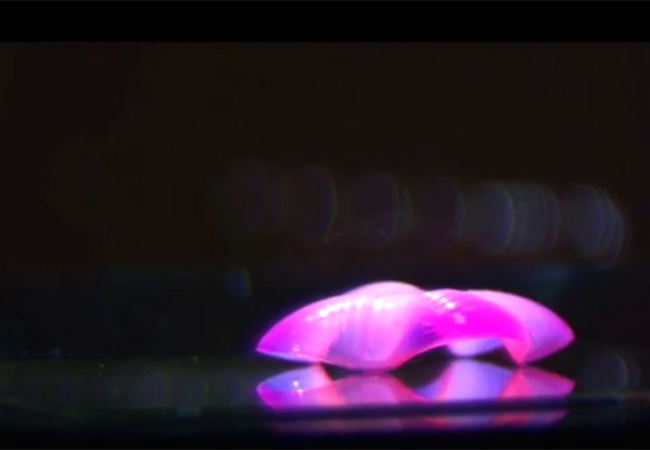 The ability to spatially control the rates of shape changes allows to fabricate dynamic 3D structures with programmed sequential motions, as previously demonstrated with photopatterned hydrogels responsive to different molecular inputs and those with different thicknesses. Such ability is critical for implementing complex functions but challenging to attain with global external stimuli. This work introduces a 3D fabrication method with the advantages of traditional (scalable) and additive (customizable) manufacturing for fabricating soft devices with programmed 3D morphologies and motions.